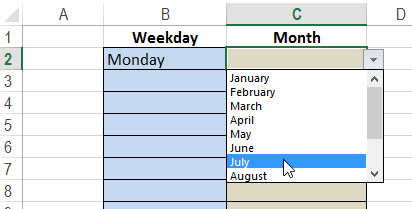 You can use Data Validation to create a dropdown list of options in a cell. However, the list font can’t be changed, nor can the number of visible rows, which has a maximum of eight. Also, Data Validation doesn’t have an AutoComplete feature, which finds matching items in the list as you start to type. 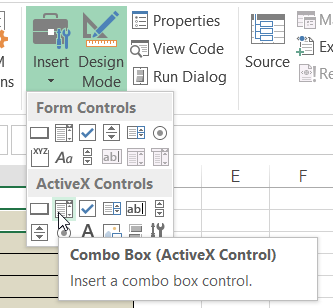 To overcome these limitations, you can add a combo box to your worksheet, and use programming to make it appear in cells that contain a data validation list. 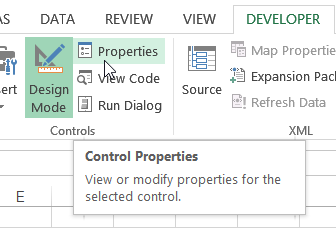 Double-click on a cell that contains a data validation list, and the combo box appears. 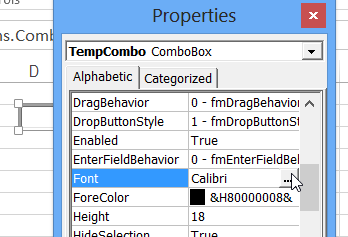 The combo box’s font size can be set, more than 8 rows can be displayed, and autocomplete can be enabled. Note: If the worksheet is protected, allow users to Edit Objects, and they will be able to use the combobox. Two worksheets are required in this workbook. IMPORTANT: Set the ValidationLists sheet at 100% zoom, to avoid crashing Excel. There is a strange bug connected to combo boxes and zoom levels. You can adjust the zoom level on the ValidationSample sheet, but do not change ValidationLists from 100%. The next step is to create the dropdown lists. Cells C2:C12 have data validation lists with the source DayList. 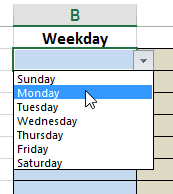 When a cell in this range is selected, a dropdown list of weekdays is available. Cells D2:D12 have data validation lists with the source MonthList. 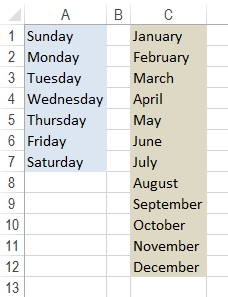 When a cell in this range is selected, a dropdown list of months is available. Click Insert, and under ActiveX Controls, click on the Combo box button, to activate that tool. 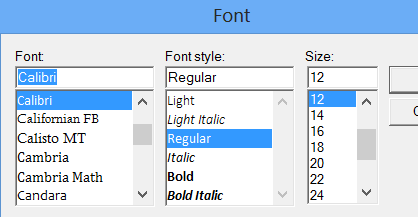 In the Font dialog box, select a font, font size, and other settings that you want for your combo box, then click OK.
On the Developer tab, click the Design Mode button, to exit Design Mode. Visual Basic for Applications (VBA) code is required to make the combo box appear when you double-click in a cell that contains a data validation list. 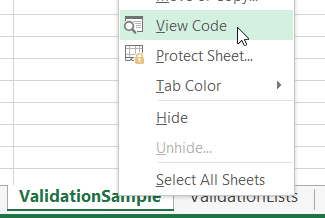 Right-click on the ValidationSample sheet tab, and click View Code. Choose Edit | Paste, to paste the code onto the sheet module, where the cursor is flashing. IMPORTANT: Leave the ValidationLists sheet at 100% zoom, to avoid crashing Excel. There is a strange bug connected to combo boxes and zoom levels. 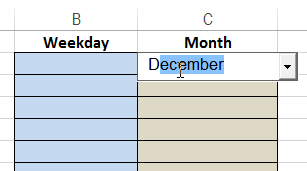 Double-click on one of the cells that contains a data validation list. The selected item appears in previous cell, and the combo box disappears. 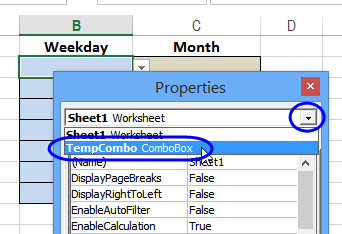 If you decide to change the combo box properties later, it might be difficult to find the combo box on the worksheet, because the code changes its width to zero. 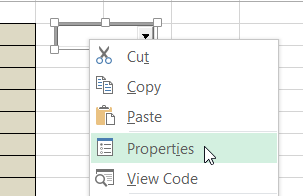 Adjust the properties that you want to changeNOTE: The combo box width and height are set in the macro — changing these values in the property window will not have a long term effect. Edit the code, if you want the size to change. When finished, close the Property window, and click the Design button, to exit Design mode. To test the combo box code, you can download the zipped sample files DataValComboboxSheet_NamedRange.